Cirque du Soleil has had a strong history of weaving stories, often of the mythical variety, into their amazing circus performances. Then they add some special effects that are so phenomenal, you can’t help but think they’re real. With TORUK – The First Flight, they flip the script a bit, quite literally, by weaving circus arts into a cohesive story. A hero’s journey, of course. 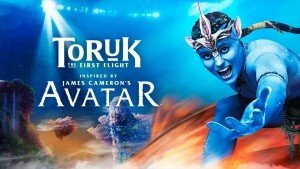 TORUK – The First Flight is based in Pandora, the lush world from Avatar, James Cameron’s 2009 epic film. It takes place 3000 years before the movie. Ralu and Entu, lifelong friends and members of the Na’vi Omaticaya Clan, have finally come of age. They take part in their clan’s Initiation ceremony where one passes… and one fails. Soon after, an earthquake hits and the Shaman sees a vision of the destruction of the Tree of Souls. The Omaticaya fear for the future of the Na’Vi, so the two boys set out on a quest to save the tree. They must visit four other clans to obtain objects to help summon the much-feared flying Toruk, but the clans do not trust each other and the obstacles are great. They are joined by spirited Tsyal of the Tawkami Clan who defies her father to help them. The trios journey eventually takes them to Hallelujah Mountains where they come face to face with the great Toruk. But will they be table to tame it? And will they make it back in time to save the Tree of Souls and the Na’vi? Of the several Cirque du Soleil shows I have seen, TORUK – The First Flight feels the least like a circus. Where you’ll often find a wide range of circus acts throughout their shows, the circus arts are well-integrated into TORUK and there are few of the large-scale acts you may be used to. There are no traditional contortionist, juggling, unicycle, hand-balancing, trapeze, high-wire, or Russian swing acts. Instead you’ll find plenty of tumbling, balancing, aerial silks and rope, poles, and some other creative aerial acts. There is also quite a bit of puppetry, as well as a beautiful scene with soaring kites. I don’t want to give too much away, but the special effects in this show are truly amazing. With some clever choices in sound effects and lighting, as well as the gorgeous projected scenery, you a are easily transported through the wilds of Pandora. They also manage to capture the raw power of nature. The set takes up the entire floor and every bit of it is transformed. 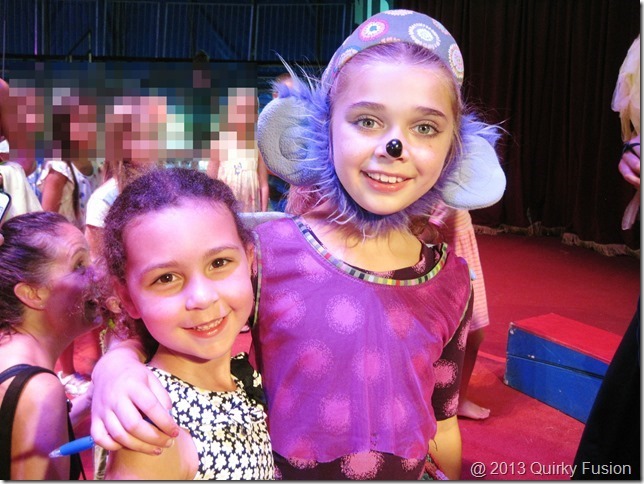 Sometimes even the audience is transformed! If you do head off to see TORUK, make sure you download the app first (Android, iOS). While I’m a big fan of putting cell phones away during the show (including for photos), this is the first time I’ve seen an app that actually interacts with the show itself. Unfortunately, I wasn’t aware of that before I arrived and it took most of the first act to download the app. And then I didn’t know you had to check-in for it to work. So, learn from my lesson… download the app in advance. When you check-in, it will ask for your exact seat in the theater. At several moments throughout the show, you’ll get a notification (it should vibrate if your sound is off) to use your phone to interact with the performance. I don’t want to give away all of the fun, but there is a thunderstorm at one point. You’ll hold up your phone and the app will trigger your flash to go off in synchronization with others in your area, to simulate lightning. It’s just kind of fun, especially for kids. Unfortunately, TORUK is only in the Boston area for a few days (it’s at the DCU center through 12/13). That’s OK, because it’s still in previews. It opens officially on December 21 in Montreal. It will be back in Providence in June, 2016, though, so buy your tickets for that. It’s worth it. If you’re not in the Boston area, there’s good news, because chances are you haven’t missed it yet. You can see TORUK – The First Flight tour dates and buy tickets on the Cirque du Soleil website. The ticket range in Providence is $35-120. It’s an expansive set, so even the balcony seats should be amazing. In some ways, this is one of the better Cirque du Soleil shows for kids. There are none of the weird, creepy characters that Cirque often employs, and no suggestive content. There is a strong plot, and a narrator to help you follow the action. Sure, there’s a little less circus flashiness, but the special effects and plot more than make up for that. The run time is 1 hour and 30 minutes with a 20 minute intermission. Do be forewarned that this is an adventure story with some peril and potentially scary special effects. It’s not a great choice for really little ones or for kids who are particularly sensitive. I’ve got a 10-year-old who deals with sensory overload at times and also intense scenes/themes. He struggled a bit, especially early on. This is one of my favorite Cirque du Soleil shows, but I have to say that it is not the best show if you’re looking for a lot of flashy circus acrobatics. It’s more like seeing a Broadway show than a circus. As my kids study circus, I like to bring them out to inspire them. This certainly inspired my daughter, who is obsessed with aerial silks, but as I mentioned, the circus acts are toned down from what I’d normally expect to see at Cirque du Soleil. Go into it with that in mind and you’re bound to enjoy the show, however. It truly is a work of art. Looking for a family-friendly Cirque show with more circus arts? Definitely check out Cirque du Soleil’s Kurios! Disclosure: We received complimentary tickets for review purposes. There was no other compensation and all opinions are my own. Images are courtesy of Cirque du Soleil. Worst Cirque du Solei show I have ever seen. It was horrible! Sorry you didn’t enjoy it. It was my favorite so far! You obviously don’t know what Cirque is capable of. On the contrary, I know exactly what Cirque is capable of. I specifically state in my review that Toruk is missing a lot of the major circus arts people are accustomed to in Cirque du Soleil shows. I still enjoyed it immensely. I thought the special effects were stunning and I appreciated having a concrete storyline. I can see why people might be disappointed if they were looking for a specific type of experience, but that didn’t take away from my enjoyment. In fact, I enjoyed having something out of the norm. But, if you’re looking for something more in line with other Cirque shows, I would highly recommend Kurios. Definitely a return to a more traditional set of circus arts, as well as some wonderful innovation. And still not quite as bizarre as a show like Varekai. Cirque delivered a different kind of show, but obviously still very compelling for many of us. Yes, there were fewer circus arts, but the special effects were stunning and I enjoyed having a concrete (and clear) plotline. That said, if you want more traditional Cirque, Kurios is my new favorite. A definite return to the circus roots, while also incorporating a lot of innovative content. And not nearly as muddled and weird as something like Varekai. This was a amazing disaster. I am a huge fan of Cirque’s earlier days. The acrobatics were on par of a high school gymnastics team…wait, high school was much better. Where were the amazing acts and singing? Toruk was unpolished, un-synchronized and an embarrassment to the franchise. Tripping on kite strings, props, each other. The vastly empty seating was a testament that others already knew the show was sub-par. Obviously stealing ideas from Lion King stage production. I would not be surprised at all if the creators behind Toruk were the same behind the traveling “How to Train Your Dragon” debacle. Sorry to hear you hated it so much. We didn’t experience any of the mishaps that you did, nor was the seating empty. But I do agree that it was different from what many people expect from Cirque du Soleil, so if you were looking for something specific, you could easily be disappointed in that regard. I try to take each show as unique and I thoroughly enjoyed Toruk. That said, we more recently saw Kurios and WOW. Back to the more traditional circus arts and just plain amazing. Thanks for sharing your thoughts! Agreed. Major disappointment so much that I was annoyed I paid so much for the tickets. Wheree were the mind blowing acrobats? Lame story line. More like a play with lots of special effects. Wish I would have read the reviews first. What a huge disappointment. My fourth show and by far the worst. No amazement, no acrobatics to speak of, no live music, no “wow” I wish I could get my $300.00 back for two great seats for a lousy show.